Innok TX | ROBOTS IN SEARCH INC. 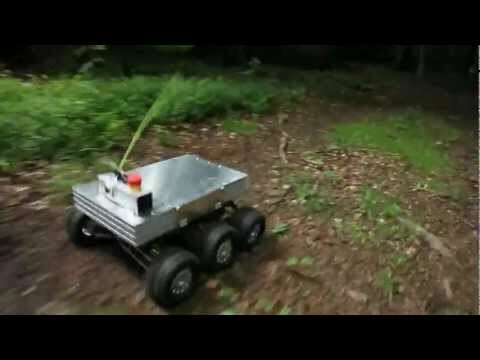 The Innok TX is a six wheeled robotic platform well suited for outdoor use. Equipped with independent suspension and reaching maximum speeds up to 10 m/s it shows its strengths especially in the open terrain. The Innok TX uses a novel concept for robotic platforms. It is equipped with an elaborate suspension and can reach speeds up to 10 m/s and more, owing to its drivetrain. Thus, it is interesting for research areas and applications where conventional robotic platforms were not fast enough up to now. This is made possible by one gearless hub motor within each of the six wheels. Every motor is provided with its own independent and freely configurable controller. For use at high speeds this allows the implementation of a vehicle dynamics control which can manipulate every single wheel independently. In order to get the most out of the motors the Innok TX uses a system which adapts the engines to the required load. In continuous operation the motor temperatures are kept at a safe level. However, temporarily the motor controllers can demand a many times higher amount of torque than in continous operation. This fuzzy logic control dynamically adapts output power without any hard switchover. As a result, for a limited time you can call an impressive power of up to 2.4 kW and a total torque of up to 12 Nm. Nevertheless, the Innok TX can move almost silently due to its gearless motors. The vehicle-internal communication is based on a CAN Bus (CAN 2.0A), which is used to manage the motor controllers. Additionally, it delivers all vehicle information like cartesian odometric data, speeds and motor currents. The bus can be accessed by an externally mounted USB port. algorithms directly on the Innok TX. Simply mount your own hardware to the standard aluminum profile rails with a groove dimension of 5 mm which is compatible with common profile rail systems like those from Bosch or Item. With the optional mounting kit (order no. IR-MOKTXC000) you receive a set of profile rails of different lengths and numerous connectors which you can mount in any way you want to attach your hardware to the Innok TX even quicker. The integrated power distribution system offers you regulated voltages of 3.3 V, 5 V and 12 V as well as the battery voltage. On request, Innok Robotics performs the complete integration of sensor technology onto the Innok TX. Simply chose from various components like laserscanners, ultrasonic sensors or IP cameras. For a list of components offered for integration by Innok Robotics. In order to protect your components from shocks even at high speeds the Innok TX has a fully spring-borne independent suspension. The supplemental oil pressure shock absorbers ensure the wheels' contact to the ground at any time. The suspension offers a special kinematic system which acts contrary to lateral body roll to keep the vehicle upright even in hard turns at high speeds. The lightweight and robust aluminum chassis of the Innok TX is especially designed for the potential of the drivetrain and the resulting speeds and forces. You can exactly adapt the Innok TX to your needs by its independently adjustable suspension with a range of spring of up to 80 mm. Thus, you stay completely free referring to maximum weight, weight distribution, traversed ground and preferred speed. For special requirements Innok Robotics offers dimensioning of the springs for a defined case of application (order no. IR-INTTX0F01). As a fast robotic platform for outdoor use the Innok TX is protected against intrusion of water and dust by type of protection IP54. From asphalt to sand, forest and field soils right up to mud and snow the Innok TX can drive on various grounds. With its chassis clearence of 133 mm it can even pass higher obstacles without getting stuck. Especially due to its high speeds the Innok TX opens up plenty of new potential applications which were not imaginable with other robotic platforms up to now. By a number of upgrade options with different hardware components you can customize your Innok TX or you simply integrate your own hardware.